Angeles National Forest, Vetter Mountain fire lookout tower near Los Angeles, California. Beyazıt Tower, is an 85 m (279 ft) tall fire-watch tower located in the courtyard of Istanbul University's main campus (formerly Ottoman Ministry of War) on Beyazıt Square. A fire lookout tower, fire tower or lookout tower, provides housing and protection for a person known as a "fire lookout" whose duty it is to search for wildfires in the wilderness. The fire lookout tower is a small building, usually located on the summit of a mountain or other high vantage point, in order to maximize the viewing distance and range, known as view shed. From this vantage point the fire lookout can see smoke that may develop, determine the location by using a device known as an Osborne Fire Finder, and call fire suppression personnel to the fire. Lookouts also report weather changes and plot the location of lightning strikes during storms. The location of the strike is monitored for a period of days after in case of ignition. The typical fire lookout tower consists of a small room, known as a cab located atop a large steel, or wooden tower. Historically, the tops of tall trees have also been used to mount permanent platforms. Sometimes natural rock may be used to create a lower platform. In cases where the terrain makes a tower unnecessary, the structure is known as a ground cab. Ground cabs are called towers, even if they don't sit on a tower. Towers gained popularity in the early 1900s, and fires were reported using telephones, carrier pigeons, and heliographs. Although many fire lookout towers have fallen into disrepair as a result of neglect, abandonment, and declining budgets, some fire service personnel have made an effort to preserve older fire towers, arguing that a good set of human eyes watching the forest for wildfire can be an effective and cheap fire safety measure. A fire lookout uses an Osborne Fire Finder to obtain the azimuth and distance to a suspected fire. From these measurements he will call in a "Smoke Report". The history of fire lookout towers predates the United States Forest Service, founded in 1905. Many townships, private lumber companies, and State Forestry organizations operated fire lookout towers on their own accord. The Great Fire of 1910, also known as the Big Blowup, burned 3,000,000 acres (12,000 km2) through the states of Washington, Idaho, and Montana. It is still arguably the largest forest fire ever in recorded history. The smoke from this fire drifted across the entire country to Washington D.C. — both physically and politically — and it challenged the five-year-old Forest Service to address new policies regarding fire suppression, and the fire did much to create the fire rules, organizations, and policies that we have today. One of the rules as a result of the 1910 fire stated "all fires must be extinguished by 10 a.m. the following morning". To prevent and suppress fires, the U.S. Forest Service made another rule that townships, corporations and States would bear the cost of contracting fire suppression services, because at the time there was not the large Forest Service Fire Department that exists today. As a result of the above rules, early fire detection and suppression became a priority. Towers began to be built across the country. While earlier lookouts used tall trees and high peaks with tents for shelters, by 1911 permanent cabins and cupolas were being constructed on mountaintops. Beginning in 1910, the New Hampshire Timberlands Owners Association, a fire protection group, was formed and soon after, similar organizations were set up in Maine and Vermont. A leader of these efforts, W.R. Brown, an officer of the Brown Company which owned over 400,000 acres of timberland, set up a series of effective forest-fire lookout towers, possibly the first in the nation, and by 1917 helped establish a forest-fire insurance company. In 1933, during the Great Depression, President Franklin Delano Roosevelt formed the Civilian Conservation Corps (CCC), consisting of young men and veterans of World War I. It was during this time that the CCC set about building fire lookout towers, and access roads to those towers. The U.S. Forest Service took great advantage of the CCC workforce and initiated a massive program of construction projects, including fire lookout towers. 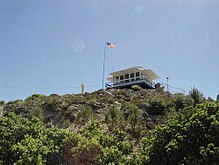 In California alone, some 250 lookout towers and cabs were built by CCC workers between 1933 and 1942. The heyday of fire lookout towers was from 1930 through 1950. During World War II, the Aircraft Warning Service was established, operating from mid-1941 to mid-1944. Fire lookouts were assigned additional duty as Enemy Aircraft Spotters, especially on the West Coast of the United States. From the 1960s through the 1990s the towers took a back seat to new technology, aircraft, and improvements in radios. The promise of space satellite fire detection and modern cell phones tried to compete with the remaining fire lookout towers, but in several environments, the technology failed. Fires detected from space are already too large to make accurate assessments for control. Cell phones in wilderness areas still suffer from lack of signal. Today, some fire lookout towers remain in service, because having human eyes being able to detect smoke and call in the fire report allows fire management officials to decide early how the fire is to be managed. The more modern policy is to "manage fire", not simply to suppress it. Fire lookout towers provide a reduction in time of fire detection to time of fire management assessment. Idaho had the most known lookout sites (966); 196 of them still exist, with roughly 60 staffed each summer. Kansas is the only U.S. state that has never had a lookout. A number of fire lookout tower stations located in New York State, particularly near the Adirondack Forest Preserve and Catskill Park, have been listed on the National Register of Historic Places. They include Arab Mountain Fire Observation Station, Azure Mountain Fire Observation Station, Balsam Lake Mountain Fire Observation Station, Blue Mountain Fire Observation Station, Hadley Mountain Fire Observation Station, Kane Mountain Fire Observation Station, Loon Lake Mountain Fire Observation Station, Mount Tremper Fire Observation Station, Poke-O-Moonshine Mountain Fire Observation Station, Red Hill Fire Observation Station, St. Regis Mountain Fire Observation Station, Snowy Mountain Fire Observation Station, and Wakely Mountain Fire Observation Station. Fire lookout tower and former fire station in Japan. During the Edo period in Japan fire lookout towers (火の見櫓, Hinomi-yagura) housed the fire fighting team of town (町火消, Machi-bi-keshi). Usually the fire lookout tower was built near a fire station (番屋, Ban-ya), and was equipped with a ladder, lookout platform, and an alarm bell (半鐘, Hanshō). From these towers watchmen could observe the entire town, and in the event of a fire they would ring the alarm bell, calling up firemen and warning town residents. In some towns the bells were also used to mark the time. While the fire lookout towers remained fully equipped into the Shōwa period, they were later replaced by telephone and radio broadcasting systems in many cities. Like the United States, fire towers were built across Canada to protect the valuable trees for the forestry industry. Most towers were built in the early 1920s to 1950s and were a mix of wood and steel structures. A total of 325 towers dotted the landscape of Ontario in the 1960s, and today approx. 156 towers span the province, but only a handful of towers remained in use after the 1970s. They are still in use in British Columbia, Alberta, Saskatchewan, Manitoba, Ontario and a few of the Maritime Provinces. Nova Scotia decommissioned the last of its 32 fire towers in 2015 and had them torn down by a contractor. The first fire lookout tower was built to the plans of Forstmeister Walter Seitz between 1890 and 1900, located in the "Muskauer Forst" near Weißwasser. Warnings were transmitted by light signal. For transmission of location, Seitz divided the forest area into so-called "Jagen", numbered areas, with that number to be transmitted to the city. He received a patent for this system in 1902. Seitz traveled to the 1904 Louisiana Purchase Exposition for a presentation of his idea in the USA. As wood had been key building material in Russia for centuries, urban fires were constant threat to the towns and cities. To address that issue, in the early 19th century a program was launched to construct fire stations equipped with lookout towers called kalancha, overlooking mostly low-rise quarters. Watchmen standing vigil there could signal other stations as well as their own using simple signals. Surviving towers are often local landmarks. Today hundreds of towers are still in service with paid-staff and/or volunteer citizens. In some areas, the fire lookout operator often receives hundreds of forest visitors during a weekend and provides a needed “pre-fire suppression” message, supported by handouts from the "Smokey Bear", or "Woodsy Owl" education campaigns. This educational information is often distributed to young hikers that make their way up to the fire lookout tower. In this aspect, the towers are remote way stations and interpretive centers. The fire lookout tower also acts as a sentinel in the forest attracting lost or injured hikers, that make their way to the tower knowing they can get help. In some locations around the country, fire lookout towers can be rented by public visitors that obtain a permit. These locations provide a unique experience for the camper, and in some rental locations, the check out time is enforced when the fire lookout operator returns for duty, and takes over the cab for the day shift. Fire lookout towers are an important part of American history and several organizations have been founded to save, rebuild, restore, and operate fire lookout towers. Starting in 2002, traditional fire watch was replaced by "FireWatch", optical sensors located on old lookout towers or mobile phone masts. Based on a system developed by the DLR for analyzing gases and particles in space, a terrestrial version for forest fire smoke detection was developed by DLR and IQ Wireless. Currently, about 200 of these sensors are installed around Germany, while similar systems have been deployed in other European countries, Mexico, Kazakhstan and the USA. Several Canadian provinces have fire lookout towers. Dorset, Ontario's Scenic Tower was built on site of former fire lookout tower (1922-1962). Many fire lookout towers are simply cabs that have been fitted to large railroad water tank towers. These huge wooden towers could extend 30 to 60 feet (9 to 20 m). One of the last wooden fire lookout towers in Southern California was the South Mount Hawkins Fire Lookout located in the Angeles National Forest. A civilian effort is underway to rebuild the tower after its tragic loss during the Curve Fire of September 2002. Steel towers can vary in size and height. These towers are very sturdy, but tend to sway in the wind a bit more than a wooden tower. The Aermotor Company, originally of Chicago, Illinois, was the first and lead manufacturer of steel fire towers from the nineteen-teens to the mid-twenties. These towers have very small cabs, because the towers are based upon Aermotor windmill towers. These towers are often found in the U.S. Midwest or the South, but few have made their way into the mountainous West. In the northeast, all of the towers in the Adirondack Mountains and most in the Catskills were Aermotor towers erected between 1916 and 1921. The typical cab of an Aermoter had a 7 by 7 feet (2.1 by 2.1 m) cab with a fire locating device mounted in the center. Access was by way of a trap door in the floor. Ground cabs are still known as "towers" even though there may be no such tower under the cab. These towers can be one, two or three stories tall with foundations made of natural stone or concrete. These towers vary greatly in size, but many are simple wooden or steel tower cabs that were constructed using the same plans, sans the tower. The simplest kind consist only of a ladder to a suitable height. Such trees could have platforms on the ground next to them for maps and a fire finder. A more elaborate version, such as the Gloucester tree in Australia added a permanent platform to the tree by building a wooden or, later, metal structure at the top of the tree and had metal spikes hammered into the trunk to form a spiral ladder. These 'platform trees' were often equipped with telephones, fire finder tables, seats and guy-wires. There are many different types of lookouts. In the early days, the fire lookout operator would simply climb a denuded tree and would sit upon a 2 ft × 2 ft (0.61 m × 0.61 m) platform chair atop that tree. An old fishing boat was once dragged to the top of a high hill and it was used as a fire lookout tower. Very little is known about the horse mounted fire lookout, but they, too, would ride the ridges patrolling the forest for smoke. Tallest lookout tower in the world: Warren Bicentennial Tree Lookout, Western Australia — 225.7 feet (68.8 m). Tallest all-steel lookout tower in the world: Beard Tower, 5 km (3.1 mi) SE of Manjimup, Western Australia — 200 feet (61 m). Tallest lookout tower in the U.S.: Woodworth Tower, Alexandria, Louisiana — 175 feet (53 m). Highest lookout site in the world: Fairview Peak, 25-mile (40 km) NE of Gunnison, Colorado — 13,214 feet (4,028 m). Lowest lookout sites in the world: Pine Island L.O., Florida & Evans Pines L.O., Florida — 2 feet (0.61 m). ^ Radio communication keeps rangers in touch. CBC Digital Archives. 21 August 1957. Retrieved 2009-02-06. ^ "Concord Monitor - Fire officials don't want towers closed". concordmonitor.com. Retrieved 6 April 2018. ^ Churchill, P. W. (1955). "W. R. Brown: Modern pioneer" (PDF). The Brown Bulletin. 4 (2): 3, 10–11. ^ A History of the Architecture of the USDA Forest Service. U.S. Forest Service, digitized by the Forest History Society. July 1999. Retrieved 2009-07-06. ^ Ray Kresek, Fire Lookouts of the Northwest. Ye Galleon Press (Fairfield, WA), 1984, p. 9. ^ Peril, Cartoon (January 28, 2012). "Fire Lookouts -- vanishing history?". Daily Kos. Retrieved February 28, 2018. ^ "Ontario's Fire Tower Lookouts". ontarioftl.bravehost.com. Retrieved 6 April 2018. ^ "Iconic fire towers becoming a thing of the past in Nova Scotia". The Chronicle Herald Newspaper. 2016-09-27. Retrieved 2017-12-03. ^ Steere, Peter L. (July 1987). "Lookout Trees on the Kaibab National Forest". National Register of Historic Places Inventory - Nomination Form: Multiple Property Survey, National Forest Fire Lookouts in the Southwest Region, USDA Forest Service. p. 7/2–7/4. Retrieved 24 July 2012. ^ a b c d e Kamstra, Rex. "Forest Fire Lookout Trivia". www.firelookout.com. Retrieved 6 April 2018. ^ Nova Scotia Wildfire Detection. Nova Scotia Government, Department of Natural Resources. Retrieved 2009-02-24. Wikimedia Commons has media related to Fire lookout towers. Kresek, Ray (1998). Fire Lookouts of the Northwest (3rd ed.). Historic Lookout Project. p. 414 pp. ISBN 0-87770-632-8. Spring, Ira; Fish, Byron (1996). Lookouts: Firewatchers of the Cascades and Olympics (2nd ed.). Mountaineers Books. p. 224 pp. ISBN 0-89886-494-1.